Universitas Muhammadiyah Yogyakarta (UMY) is one of the committed campus in Indonesia in developing science and technology based on Islamic values for the benefit of the people. 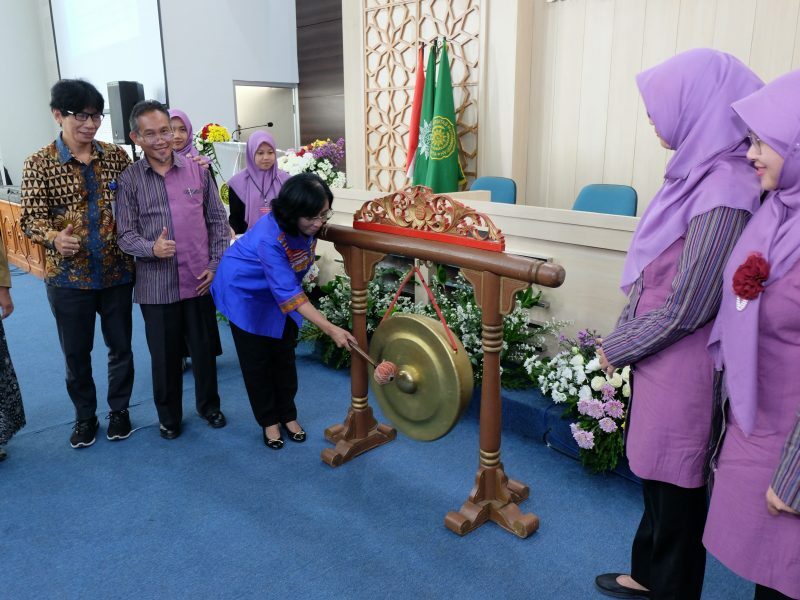 On Wednesday, October 17th The Pharmacy Study Program of the Faculty of Medicine and Health Sciences officially opened the 1st International Conference on Pharmaceutical Updates (1st ICPU) University of Muhammadiyah Yogyakarta in collaboration with the Indonesian Society for Cancer Chemoprevention (ISCC) lasting three days Wednesday-Friday (October 17-19 2018) at the KH Ibrahim E6 Building Integrated Campus of the Muhammadiyah University of Yogyakarta. The agenda was attended by the Director of Governance of Public Medicine and Health debriefing of the Directorate General of Pharmaceuticals and Medical Devices Engko Sosialine Magdalene, Apt., Japanese NAIST Call Biology Tumor Expert Prof. Jun Ya Kato, Expert in Medicinal Chemistry of Boron Drug Boron Meutron Capture Therapy, Osaka Japan Prof. Mitsunori Kirihata, Ph. D., and Phyntotherapy Expert for Malaysia’s Antitumor Taylor Ubiversity Prof. Dr. Ibrahim Jantan M, Sc., Ph. D and expert on Chemistry Of Chemotherapy Agent Sabtanti Harimurti, Ph. D., Apt. This 1st International Conference on Pharmaceutical Updates (1st ICPU) program discusses the handling technology for cancer patients who continue to develop in the first day. Research is carried out not only in medicine but also for prevention efforts to avoid various types of cancer. The discussion was also carried out by adjusting the research to therapeutic methods of treatment, pharmaceutical care, chemoprevention about the development of drugs that can be used to prevent cancer or other findings related to cancer from various countries. On the second day, This 1st International Conference on Pharmaceutical Updates (1st ICPU) program was Oral Presentation Session from the lecturer from Malaysia, Thailand, and also Yaman. Later on, the agenda was proceed to the Scientific Article Writing and Handling Cytotoxic Workshop. “In the future, the 2nd International Conference on Pharmaceutical Updates (2nd ICPU) will be collaborate with Association of Muhammadiyah Pharmacy Higher Education (APTFM) in International Conference entitled “Muhammadiyah International Conference on Health and Pharmaceutical Development (MICH-PhD)” said Pramitha Esha Nikmah Dewi Msc., Apt as the Chief of 1st International Conference on Pharmaceutical Updates (1st ICPU). “It’s the first time we held the International Conference, therefore we hope in the future we can increase the quality of the agenda. We will always try to give the best, in line with our university’s vision in always committed to develop the science and technology for Ummah”, she added.